Selecting your cubicle hardware can be a difficult decision, but follow our quick and easy steps below to ensure you purchase all of the products you require for your cubicle doors. To begin with you’ll need to establish your requirements, check the layout and configuration or your cubicles, noting down how many or your cubicle doors are open inwards and open outwards along with whether the cubicles doors are flush with the partition or overlapping. You’ll also need to check the thickness of partition that has been used to construct you cubicle, usually 13mm or 20mm. An indicator lock or indicator bolt as its sometimes known is a cubicle locking mechanism with an indicator that displays if the cubicle is vacant or engaged. A cubicle lock keep holds the indicator bolt in place when your door is locked. There is a wide range of lock keeps to select from depending on the thickness of the cubicle door, partition and whether your doors are flush or overlapping. Cubicle door buffers may be required for use alongside your keep on overlapping cubicle doors. Usually used in pairs buffers ensure the correct positioning of your indicator lock into the keep, whilst reduces the changes of finger trapping and stops the cubicle door banging shut. A combination or ‘L’ and ‘U’ cubicle brackets are used to fix the glass or laminated partitions together to form a cubicle. Cubicle hinges enable the door to be moved into an open and closed position. Depending on how you’d like your cubicle door to operate gravity, unsprung and sprung hinges are available. Cubicle headrail provides support for the cubicle partitions whilst finishes the top of the cubicle with a contemporary trim. Cubicle leg supports raise the partition from floor level whilst supporting their weight. Fixed or adjustable cubicle legs allow for the partition to be raised from 20mm to 180mm. Cubicle coat hooks with built-in buffer help to avoid damage being caused to the partition and elevate clothing and valuables from floor level. A must in all toilet cubicles. Toilet roll holders are used to keep your toilet roll elevated from the floor and ensure it is within easy reach of the user. 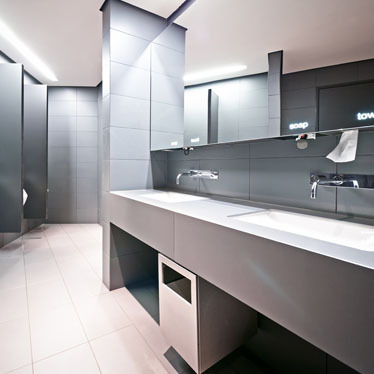 For wet areas (for example a swimming pool facility or spa), we would advise the use of Grade 316 stainless steel cubicle fittings where possible as they provide the highest resistance to corrosion. Please note that you do still need to maintain your cubicle hardware regardless of the grade of stainless steel you choose. It is best to clean stainless steel products simply by using a soft damp cloth and then buff with a soft dry cloth to ensure no residue is remaining on the surface. If you are fitting out disabled toilet cubicles or any other type of cubicle for disabled use then ensure that the cubicle hardware you fit is DDA compliant. As cubicle configurations vary from one installation to the next you’ll no-doubt have a combination of left and right hand opening doors, make sure to check that the cubicle hinges you order will be handed in line with your requirements. Finally check that all of the cubicle fittings you purchase are suitable for use with the thickness of partition you will be installing, standard thicknesses of cubicle partitions are 13mm & 20mm.